William Dunch's origins are uncertain, although he apparently came from Northamptonshire where he certainly had relatives living at Easton-on-the-Hill. He was educated as a lawyer and had chambers at Gray's Inn. By 1540, he had a acquired for himself a minor appointment at the Board of the Green Cloth, the government department controlling the Royal Household below stairs. His work there has since gained some prominence amongst historians for he gathered together a collection of the board's historical financial accounts called 'The Book of the New Ordinary of the Honourable Household' (now known as 'The Manuscript of William Dunch'). It includes bills for various ceremonial feasts, as well as those for Richard III's coronation, Jane Seymour's funeral and Edward VI's christening. In fact, William seems to have been something of an early antiquarian, for there is also a notable correlation between the manors he later acquired and the prehistoric and Roman sites visible on the land, both then and today. These included the hillfort on one of the twin hills of Wittenham Clumps, locally named after William's wife as 'Mother Dunch's Buttocks'. In 1546, William was appointed Auditor of the Royal Mint, overseeing work at the Tower of London, York, Canterbury, Bristol and Southwark. In fact, he may have held this position on a temporary basis for some two years already. He was heavily involved in Henry VIII's disastrous policy of debasing the English coinage and its subsequent restoration under Edward VI. He was paid a good salary of 200 marks (£133-13s-4d - today that would be nearly £27,000) per annum for his trouble, but, despite acting under the King's orders, it was a dangerous business. Luckily, William was pardoned in 1552 for any 'treasons' he may inadvertently have committed. Indeed, in 1549, William had spent a short period in the Fleet Prison, but this may have been due to his attachment to the Lord Protector, Edward Seymour, Duke of Somerset, who fell from power at this time. William was soon released, though his bail cost £4,000 (that's an amazing £800,000 today!). By 1551, however, he had relinquished his auditor's post and was given an annuity of £100 in recompense. William had married Mary the daughter of William Barnes, Porter of Guisnes Castle in France, in 1547 and he now had a young family of two sons, Edmund and Walter. William now purchased for himself a family coat of arms (1552) and, with the fortune he had carefully amassed, he began to invest in land in a big way in order to build a future for his sons. In 1548, he had already purchased Avebury Manor in Wiltshire for £2,000 (£400,000 today) from one of his colleagues at the Bristol Mint. In 1553, he acquired Little Wittenham from his old boss, Sir Edmund Peckham, and this became his main country home. He probably built a fine Tudor mansion there with superb views of the Wittenham Clumps, though no details of this building have survived. William was good to the locals. He allowed two poor people to eat in his kitchen every Sunday and paid for Little Wittenham Church to be extended. More land acquisitions followed around Dorchester in Oxfordshire, around Ickford in Buckinghamshire and especially in the Vale of the White Horse in Berkshire, where he purchased the manors of North Moreton, Brightwell, Eastrop, Rush Court and Charney, as well as farms in Aston Tirrold and West Hagbourne and a number of church advowsons (the right to appoint rectors). Towards the end of his life, he also purchased Silchester in Hampshire. Most of William's estates were left in the hands of stewards, although, when they were old enough, his sons took on two of them, Edmund living at Brightwell and Walter at Avebury. The father's time was fully taken up with his legal practice and the large number of local appointments he had acquired. His legal knowledge did, however, help him considerably when his land management led to local controversy. At West Hagbourne, for example, with his partner James Braybrooke, he had a dispute in 1582 with their landlord, Andrew Windsor, after they fenced in the 'Great Wood' on Hagbourne Down. Windsor, along with John Latton of Kingston Bagpuize House, encouraged the villagers to riot and demand the return of their common rights, collecting firewood and the like. They twice marched on the wood, armed to the teeth with numerous weapons, and pulled down the fence. Windsor was actually using this as an excuse to try and reclaim the land, but Dunch proved that the villagers had never had common rights in his wood and, using the 'Tree Preservation Act' which he may have helped to draw up, he won the case. In 1557, William was enquiring into vagabonds from Cornwall, calling themselves 'Egyptians', who were causing trouble in Reading. Two years later, he became both Escheator (investigating un-owned land) and Justice of the Peace for Berkshire, holding the latter post for almost twenty years. In 1563, he was elected MP for Wallingford and, seven years later, he was made Sheriff of Berkshire. In this position, he was present during the infamous case at the Abingdon Quarter Sessions, in October 1571, when Sir Edward Unton's servants attacked those of John Norreys. Unfortunately, William was unsuccessful in his attempts to stop the riot. In 1567, Dunch was one the commissioners of sewers on the River Thames, overseeing the condition of local waterways. A similar commission throughout Berkshire, Wiltshire and Hampshire followed. In 1573, he was appointed commander of musters for the Berkshire Militia. In his latter years, William was appointed Esquire Extraordinary to the Body of Queen Elizabeth I and worked with great men like the Royal Treasurer, Lord Burghley; the Lord Keeper of the Great Seal, Thomas Egerton; and the Queen's Principal Secretary, Robert Cecil; and, in the 1580s, he was presiding in the Prerogative Court of Canterbury. William Dunch lived to the great age of eighty-six. Not surprisingly, in old age, he is known to have used a coach for travelling, rather than a horse. 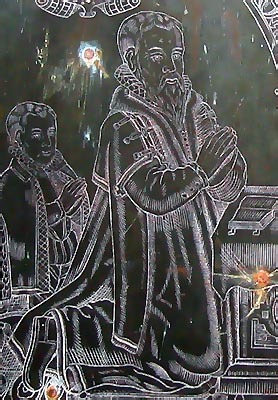 He finally died on 11th May 1597 and was buried under a fine brass memorial in Little Wittenham Church. He was succeeded in the majority of his estates by his eldest son, Edmund, who was later to become the grandfather of Lord Burnell of East Wittenham. Largely based on the work of Peter Annells.